The Rokform Fuzion Case wraps your iPhone 7 or iPhone 7 PLUS in virtually impenetrable 6061 T-6 aircraft grade aluminum and Carbon Fiber, Coupled with a drop-resistant interior shell made of TPU, this effectively guards your phone against everyday handling as well as extreme impact. When you choose American-made, you support local job creation and the U.S. economy. Our aluminum iPhone 7 and 7 PLUS cases are designed, engineered, CNC machined and hand assembled right here in Orange County, California. It's a purchase you can feel good about. Need an ultra-protective case for your iPhone 7 or iPhone 7 PLUS? 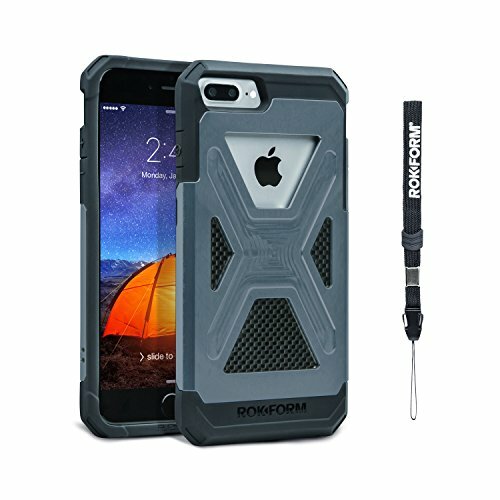 The Rokform Fuzion Case is our most protective case. Constructed of aircraft grade aluminum, Carbon fiber and a soft inner liner with reinforced corners designed to absorb shocks and drops. This design provides a dual layer of protection that exceeds military drop test standards MIL-STD 801G-516.6. It was created with active people in mind and is used in a variety of sports, activities and industrial uses. Our iPhone 7 and 7 Plus protective case has undergone rigorous testing to ensure it stands up to life's hard knocks. In fact, we stand behind every case we sell. If you ever have a problem with a Rokform product, our Five Star customer service team is standing by to help. The Rokform Fuzion Case for the iPhone 7 and 7 PLUS has a 4-point protective front and rear guard that raises your device slightly when it's placed on a hard surface. This helps shield your phone from abrasive materials that can scratch, crack or even shatter the screen and keeps the phone from sliding on smooth surfaces whether its placed face down or face up. Our Fuzion iPhone 7 and 7 PLUS cases have extra-large openings for your charger port and allow full sound to come through both speaker openings making the case as functional as it is convenient. We listened to the reviews and improved the response of the buttons and raised them slightly to make them easier to find and push without even having to look. Since the Rokform Fuzion Case for iPhone 7 and 7 PLUS requires no screws, we were able to give it a highly streamlined design. It's thin enough for everyday use with protection for the most extreme conditions. No more bulky cases. Yes. The safety lanyard is included. Used by men and women the safety lanyard is great for travel, taking photos and easily finding your phone in your purse or pocket. What colors does in come in? We have several colors to choose from, Black, Gun Metal, and Clear Anodized Natural Aluminum. Very easy. Our Rugged case designed for everyday protective use and convenience. Removal and installation is easily done within seconds. . Does the Aluminum affect the phone signal? No. The aluminum has not effect on the phone signal, GPS, Bluetooth or Wi-Fi. The aluminum is strategically placed to have no interference with any of the phones functionality. Do you make this case for the iPhone 7 and iPhone 7 PLUS? Yes. This case is available for both, just select the model and color you need on this page. Is the inside hard plastic or soft and what are the corners made of? ? The interior of the case is made from durable from TPU rubber that is semi soft and won't scratch or harm your phone. The corners are made from the same material and offer excellent shock and drop protection. All Rokform products are backed by our satisfaction guarantee. All of our products are shipped to Amazon from our Southern California headquarters and we manufacture and assemble most products in house so it's easy for us to fill your needs quickly with no hassle. Our 5 Star Customer service team based at our headquarters in Southern California is always ready to help (check our Yelp reviews). If it's a warranty replacement, spare part, question or anything in between our goal is to make every customer a customer for life. If are the original purchaser of our product and you have a problem, call us and we will fix it. Give us a try and see, or run on over and visit us in our showroom!"